Well hello there! Apologies for my absence – I’ve moved house, moved PhD (transferred to Bristol in order to follow my lovely supervisor), and started a new job – so it’s been an extraordinarily busy and exciting start to 2015! As well as a final year PhD student, I’m also now a Research Associate at UCL, working on a really exciting two-year AHRC-funding project called The Academic Book of the Future – perfectly balancing my interests in the book between the past, present, and future! This post introduces the Project that I’m working on. It originally appeared on LSE’s Impact Blog, and is reproduced here with their kind permission. What does the future hold for academic books? Rebecca Lyons introduces The Academic Book of the Future, a two-year project funded by the AHRC in collaboration with the British Library in which a cross-disciplinary team from University College London and King’s College London explores how scholarly work in the Arts and Humanities will be produced, read, shared, and preserved in coming years, and investigates key questions around the changing state and modern contexts of the academic book. 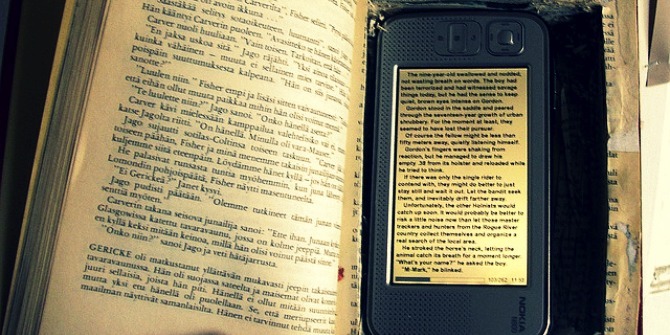 What can technology do to help make academic books more accessible? How can we make sure academic books, whether print or electronic, are kept safe, and preserved effectively? Some of these questions – for instance “what is an academic book?” or “who reads them?” appear deceptively simple. However, the academic book is changing – contexts and readers even more so – and therefore these questions have potentially very complex outcomes. As with all the best research questions, they also suggest a huge network of other sub-questions, some of which this two-year project will be addressing in the hopes of finding some answers. Anyone who uses academic books will have noticed a change (or several) in recent years in the terrain. There is the obvious expansion in the range of available formats, from traditional hardback and paperback books, to the wide world of digital, including epub, HTML, pdf, and so on. These developments, aligned with others in technology, have had a bearing on the ways in which we physically read academic books and the devices we use to access them, from tablets to laptops, pcs to e-readers, and of course not forgetting the humble hard-copy or print-out. The transition into the digital age has also brought with it some pressing questions about the traditional shape, size, and format of academic books. With more and more research taking an interdisciplinary, digitised, and innovative approach, new outputs are being produced by researchers which increasingly trouble the traditional the boundaries and definitions of the traditional arts and humanities monograph. Where, for instance, do blogs fit in? – and more importantly, how are they credited and recognised by the academy – if at all? Michael Piotrowski considers books vs blogs in terms of academic prestige in a previous post on this blog, and in doing so also touches upon some other topical issues with a huge bearing on the academic book in modern academia, namely impact and recognition. In a post-REF world where impact is king, and where departments and researchers are measured by the amount of research they can publish, how are non-traditional outputs weighed and measured in the Arts and Humanities? And what about non-traditional publication methods, such as open access? It should be obvious from this incredibly brief introduction alone that academic books and their contexts have changed, and are still changing, dramatically. We are barely scratching the surface here. How are libraries and publishers working in these changing modern contexts? What’s happening with academic books in the global south? What about non-English academic books? The Academic Book of the Future Project aims to bring researchers, publishers, librarians, booksellers, and everyone with a stake in the academic book into dialogue with each other in order to get to grips with some of these issues, and to help inform forward steps (including REF 2026). The Project is, at its core, an investigative conversation that uses a wide range of mini-projects and events to prompt meaningful discussion. The pinnacle of the Project’s activity for 2015 is Academic Book Week (9-16 November 2015). #AcBookWeek is a week-long series of events taking place across the UK and internationally to celebrate the diversity, innovation and influence of academic books, culminating in an Awards Ceremony at the British Library. If you are in any way involved with academic books – whether it is writing them, producing them, selling them, or reading them – we invite you to get involved with this week, and with the wider Project, too. Join in the conversation, and help us to identify – and even shape – the academic book of the future.